The Journal of Environmental Radioactivity provides a coherent international forum for publication of original research or review papers on any aspect of the occurrence of radioactivity in natural systems. Relevant subject areas range from applications of environmental radionuclides as mechanistic or timescale tracers of natural processes to assessments of the radioecological or radiological effects of ambient radioactivity. Papers deal with naturally occurring nuclides or with those created and released by man through nuclear weapons manufacture and testing, energy production, fuel-cycle technology, etc. Reports on radioactivity in the oceans, sediments, rivers, lakes, groundwaters, soils, atmosphere and all divisions of the biosphere are welcomed, but these should not simply be of a monitoring nature unless the data are particularly innovative. Research papers are also included which, by either experimental or theoretical approaches, aim towards an improved understanding of the behaviour, transfer and distribution of environmental radionuclides. Predictive modelling is particularly encouraged. Papers on dating methods are acceptable if they have clear geophysical or geochemical significance. Descriptions of experimental methods should be both highly original and specifically related to determination of low-level environmental activities. 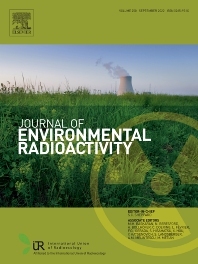 The journal provides a vehicle for objective, open and peer-reviewed publication and discussion of the more controversial aspects of environmental radioactivity, including assessments of health effects, criteria for discharge control and options for ultimate disposal of nuclear wastes. Publication in this field is also encouraged in the related book series Radioactivity in the Environment designed to complement the coverage of the journal.